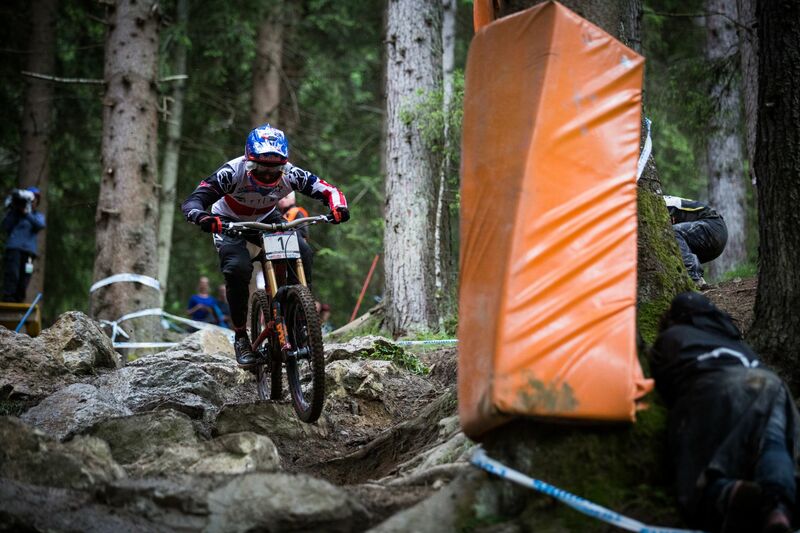 As the World Cup circus pulled into the ski resort town of Leogang in Austria for the 4th round of the UCI Downhill World Cup, attention quickly turned back to what Aaron Gwin did here 12 months ago, without a chain. What would he do here this time on his new team, what would the weather do, and which series title challengers would shine here? All of those answers got answered today as the World Cup leader showed why he loves the track in Leogang and became not only the first rider to win 3 times here, but has now also equalled the record of 90�s legend Nicolas Vouilloz with 16 World Cup wins. His rides though were impressive in their own right. Aaron is the first to admit that every time he gets to race in the European rain, he learns something, and Saturday�s qualifying gave him another opportunity to do just that. After a day of sunshine, the forecasted weather created a wet and slippery track, but Aaron qualified fastest and took the welcome 50 points. His team mate Angel Suarez also qualified for the 2nd week in a row. Race day was supposed to be wet as the weather predictions had been correct all week, but instead Leogang stole the sunshine from the rest of the Austrian Alps and the track started to speed up in strong sunshine. Times were between 7 and 10 seconds quicker than qualifying and Angel had a great run taking 15 seconds off his qualifying time and he ultimately finished 23rd, his second best result ever. By the time Aaron hit the track young Frenchman Loris Vergier, who was fastest in qualifying until he encountered a slower rider, was in the hot seat and poised to take his very first win since leaving the junior ranks at the end of 2014. The first two splits had Aaron down, as low as 1.2secs. At the 3rd split he�d come back to be just half a second ahead of Loris, but it was the 4th split that had the crowd utterly amazed. 2.4 seconds faster and then a finish time that was 3.3secs faster than 2nd place and the only rider to go under the 3mins 30secs mark. Truly an impressive display of World Cup racing and one that sees Aaron extend his lead to 160 points in the series over Australian Troy Brosnan. 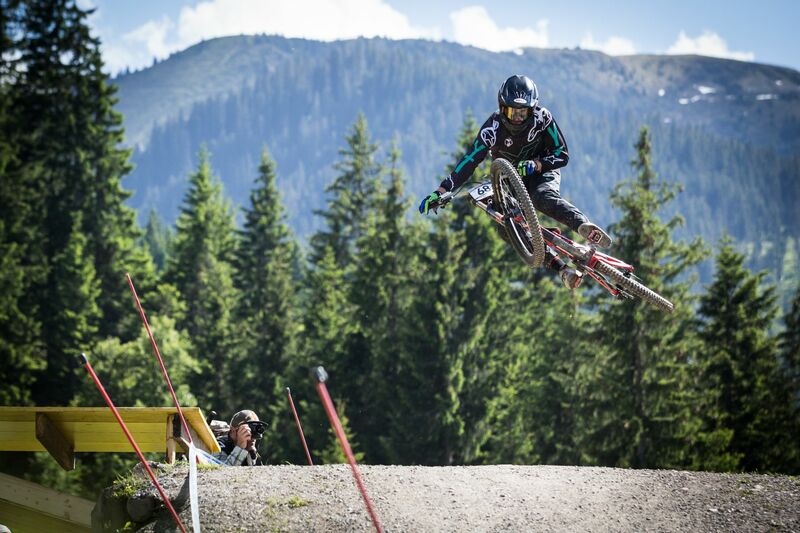 The two riders will attend an event at the Osternohe Bike Park near Forchheim Germany from July 1 to 3, before heading to Lenzerheide, Switzerland for the 5th round of the World Cup Series.